I'm going to jump back to 4th Street in downtown St Paul, I recently posted a photo from here on January 9 of the 1st National Bank Building. The building is in this shot too, you can see the cubby hole in the building if you're familiar with it. The building in the reflection is on 4th and Robert Street. I haven't been able to identify it yet, but I'm glad I was looking up when I passed this location as it made for a great capture. I love all the angles! Just a fantastic capture! I really enjoy your pics! 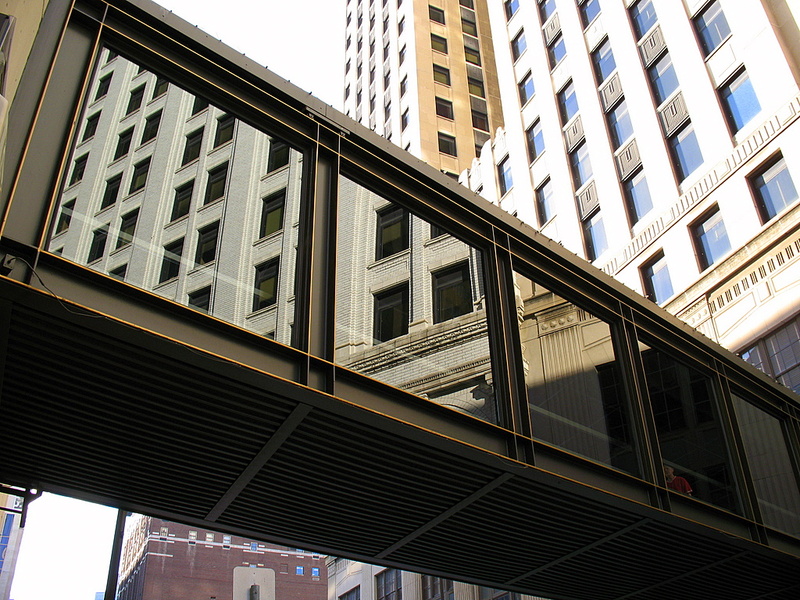 - FNB North was built in 1970 in the northern half of the block and includes the parking ramp. - FNB East was built in 1915 as the Merchants National Bank Bldg. (which had been previously located in the building in the northeast corner of 5th and Robert — the old one now surrounded by Galtier Plaza). - FNB West was built in 1931 as the First National Bank Bldg. During the banking crisis of the early 1930s, Merchants National Bank was bought by the First National Bank of St. Paul (which, at the time, was building its new building next door). If you visit the ground floor lobby, you'll notice that they made the entire east-west length appear to be the one building. It's only if you notice that the elevators on the east side only go to 16 while the ones on the west side go to 32, that you realize there are two different buildings above. BTW, if you haven't noticed, the city's highest skyway connects the two buildings on the 15th floor. Who Knew We Had This Before New York?